Here's my post from the Paper Maniac blog yesterday. This card is based on Laura's sketch found HERE. I've missed her sketches! And don't forget about the fabulous April specials going on right now! 10% off Copic single markers, 20% off Basic Grey, 30% off adhesives, 40% off Unity Stamps, 50% off clearance! WOWZA! This sale is AWESOME! Here's my card for this week. Clearly, I'm getting ready for summer already! 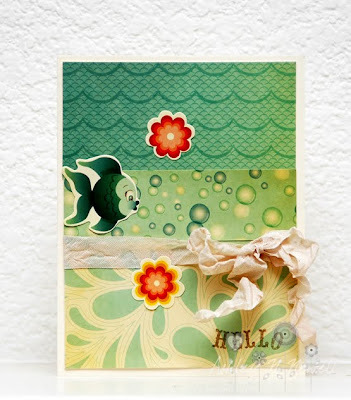 But how could you resist this super cute new Cosmo Cricket Salt Air paper? It's just so adorable! There are also sweet little matching Salt Air stickers that go with it. The stamp is from Unity/Cosmo Cricket Delovely Whimsy stamped in some Memento Rich Cocoa ink. The ribbon is seam binding that I dyed with tea.